Prototype: Austrian Federal Railways (ÖBB) class 1012 express locomotive. Built in 1997 by SGP, ELIN, and Siemens as a series of 3 prototypes. Road number 1012.003-8. Model: The locomotive has an mfx digital decoder. It also has a 5-pole skewed can motor with a flywheel, centrally mounted. The frame is constructed of die-cast metal. 4 axles powered through cardan shafts. Traction tires. The headlights are maintenance-free warm white LEDs, and they will work in conventional operation. The locomotive has separately applied grab irons and many other details. It also has detailed roof equipment. The engineer's cabs have interior details; the front one has a figure of a locomotive engineer. The locomotive has NEM coupler pockets and a close coupler mechanism. The couplers can be replaced by closed end skirting. Brake hoses can be installed on the locomotive. Length over the buffers 22.2 cm / 8-3/4. 5-pole skewed can motor with a flywheel. Headlights are maintenance-free warm white LEDs. 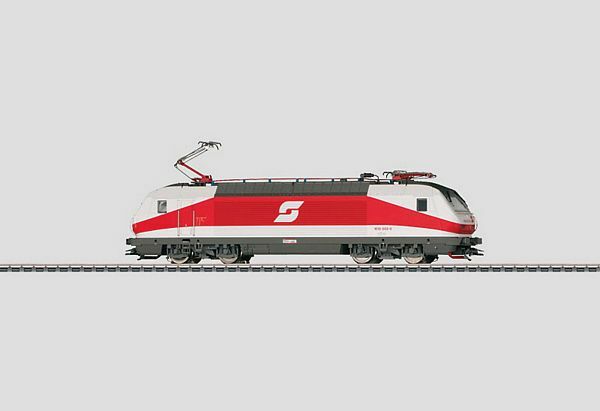 The high performance class 1012 electric locomotive was specially designed for the Austrian railroad network. The mountainous terrain with sharp curves and steep grades but also long straight routes such as in the Inn Valley or on the West Railroad / Westbahn pose great challenges in the design of locomotives for the Austrian Federal Railways. The class 1012 locomotive was originally intended for use as an express locomotive with a maximum speed of 230 km/h / 144 mph and was supposed to replace the class 1044. It was used for several years in regular scheduled service as general-purpose motive power with an output of 6.4 megawatts / 8,582 horsepower for express passenger and freight service on the point of trains for the Rollende Landstrasse / Rolling Road on the Innsbruck - Brenner line. Technically, the class 1012 was designed to haul trains of 660 metric tons on 5 ‰ grades at 220 km/h / 138 mph and of 600 metric tons on 2.8 ‰ grades at 100 km/h / 63 mph. It was designed to be able to haul express passenger trains on flat terrain and heavy freight trains in mountainous territory and with double-heading. The locomotive strongly resembled the SBB's class 460 in the design of its superstructure with the side walls of fluted sheet steel and the engineer's cab elements of fiberglass components. The mechanical part of the locomotive came from Simmering-Graz-Pauker, and the electric part was delivered by ELIN, Siemens, and ABB. The top management of the Austrian Federal Railways changed while the first three locomotives were being built, and new regulations were effected for announcing requests to tender bids in the EU region. Initially, the ÖBB no longer wanted to take delivery of the locomotives as a result, but in the end an agreement was reached and the locomotives were accepted by the ÖBB in 1997. These locomotives were stationed in Innsbruck during their entire service life. The class 1016/1116 Taurus locomotives soon represented a more economical alternative, and the class 1012 locomotives with their attractive shape remained a splinter class. This model is available with 2 road numbers: Item no. 37308 is 1012.002-0, item no. 37309 is 1012.003-8. This model can be found in a DC version in the Trix H0 assortment under item no. 22601.